Clean keema and add 1tea spoon chilly powder, half table spoon ginger garlic paste, a tea spoon of oil and half tea spoon haldi. Mix well and cook in a pressure cooker for 6 to 8 whistles and keep it aside. Heat 2 table spoons of oil in a pan. Add cloves, dalchini and cardamom. When cloves starts spluttering add finely chopped onions and green chillies. Fry until the onions turn pink, add ginger garlic paste fry for few sec. 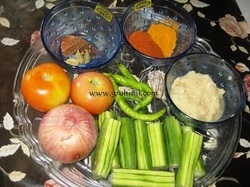 and add 1 tspn chilli powder, dhaniya powder and haldi. 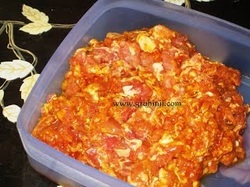 Stir, add finely chopped tomatoes, and salt and cook until it starts leaving oil. Now add cut drumsticks and cooked keema. Mix well and a cup of water and cook in a low flame until the curry is done. Take it into a serving bowl and garnish with fresh coriander leaves.